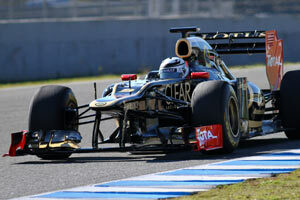 The Lotus E20 is the first car produced at Enstone to be named a Lotus, after sorting the naming row with CaterhamF1. It is also the first one to be named after the Enstone base, dropping the Rxx naming scheme that stood for Renault. The E20 was launched on 5 February with a recorded video of the car standing in the factory. It takes the track for the first time one day later at Jerez, before winter testing officially starts on 7 February. In 2011, the team took its 60% scale windtunnel into operation, an upgrade that the team relies upon to make sure the E20 is faster than its predecessor. It allowed the team to expand dramatically the realism of the tests that are performed in the wind tunnel, creating the ability to simulate more realistic steer and yaw values. Another thing is the banning of front exhausts, a system the team used on the Lotus Renault R31 but which they found extremely hard to develop. With new regulations in place, forcing all other teams to adjust their exhausts, the team's technical director James Allison is confident it posed an opportunity for Lotus to get back in front. Chassis: Moulded carbon fibre and aluminium honeycomb composite monocoque, manufactured by Lotus F1 Team and designed for maximum strength with minimum weight. RS27-2012 V8 engine installed as a fully-stressed member. Front Suspension: Carbon fibre top and bottom wishbones operate an inboard rocker via a pushrod system. This is connected to a torsion bar and damper units which are mounted inside the front of the monocoque. Aluminium uprights and OZ machined magnesium wheels. Rear suspension: Carbon fibre top and bottom wishbones with pull rod operated torsion springs and transverse-mounted damper units mounted in the top of the gearbox casing. Aluminium uprights and OZ machined magnesium wheels. Transmission: Seven-speed semi-automatic titanium gearbox with reverse gear. “Quickshift” system in operation to maximise speed of gearshifts. Cooling system: Separate oil and water radiators located in the car’s sidepods and cooled using airflow from the car’s forward motion. Cockpit: Removable driver’s seat made of anatomically formed carbon composite, with six-point or eight-point harness seat belt by OMP Racing. Steering wheel integrates gear change, clutch paddles, and rear wing adjuster. KERS: Motor generator unit driving into front of engine with batteries as an energy store. Motor Generator supplied by Renault Sport F1. Electronic control unit by Magneti-Marelli.